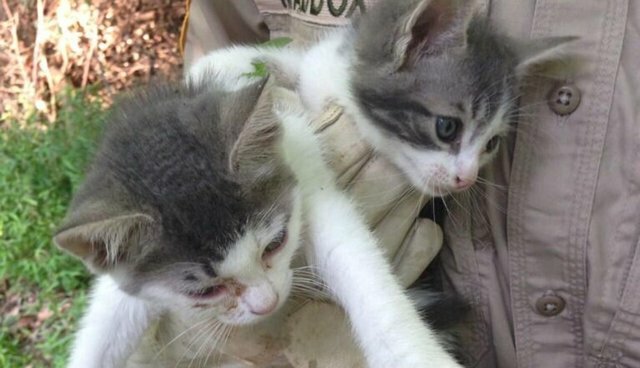 Virginia police took to Twitter today to live-tweet one officer's heroic rescue of a feral cat family. A female cat and her 13 kittens were left abandoned in a small cage when the Albemarle County Police Department was alerted to their presence. Because the department receives a whopping 250 animal control calls per month, officers don't typically respond to calls involving cats, unless they're sick or injured. However, Animal Control Officer Kim Maddox decided to make an exception for the stranded feline family today and gallantly came to their aid. Someone had abandoned the cats to fend for themselves in this tiny cage. ...so Officer Maddox scoured the area and scooped them up. She had to search a little harder for some of the kittens, but eventually found each and every one. It appeared that some of the kittens might actually be very sick. But soon enough, the entire family was corralled and ready for medical attention. ...and will hopefully find their loving forever-homes in the near future! Mom and kittens will remain under close watch at the Charlottesville SPCA for a while longer, but will be put up for adoption as soon as they're healthy and recuperated.